The climatic conditions all around are rapidly changing and the most common query in every parenting group is what foods can be offered when a baby is sick. Baby’s sickness is the most dreadful pain for me to even hear about and the intensity has increased after entering motherhood. I become so upset to even know any baby is sick. So you can imagine how mad I go when my son is sick. Any sickness/illness be it fever,cold,cough,diarrhea,vomiting has its own duration to get cured. With all super medicines,proper diet and heavenly care we can help a baby feel comfortable and try not to let the conditions worsen. One of the mommies in a reader’s group suggested me to write a detailed note of all recipes I have been suggesting for sick babies. That’s the reason behind this article. This is just sharing of my knowledge and PLEASE DON’T TAKE THIS AS AN EQUIVALENT TO ANY EXPERT MEDICAL ADVICE. Always follow your motherly intuition,baby’s cues and doctor’s recommendations. As of now I am putting down recipes of rice gruel(sadam vadicha kanji),broken rice porridge(noi kanji/arisi udaicha kanji),idly ,tomato soup and rasam. I shall keep this section updated as and when I acquire more knowledge and keep sharing. Hence PLEASE BOOKMARK THIS PAGE to stay tuned. There is no better food than breast feed or formula feed for babies below 6 months. Do not even try to feed water before six months. Whenever a baby is sick,please try to breastfeed as much as possible. Irrespective of the type of sickness breastfeed will heal and soothe baby. There is no equivalent food to breastfeed. Rice gruel is nothing but the excess water which can be drained out when you open cook rice. This can be given to babies above 6 months(without salt) in lukewarm temperature when they are suffering from feverdiarrhea / vomitting. Keep offering few spoons for babies below 2 years in regular intervals as per demand. This will help in soothing the chest congestion,keep baby hydrated and help in flushing out infections. Avoid offering this on a regular basis. 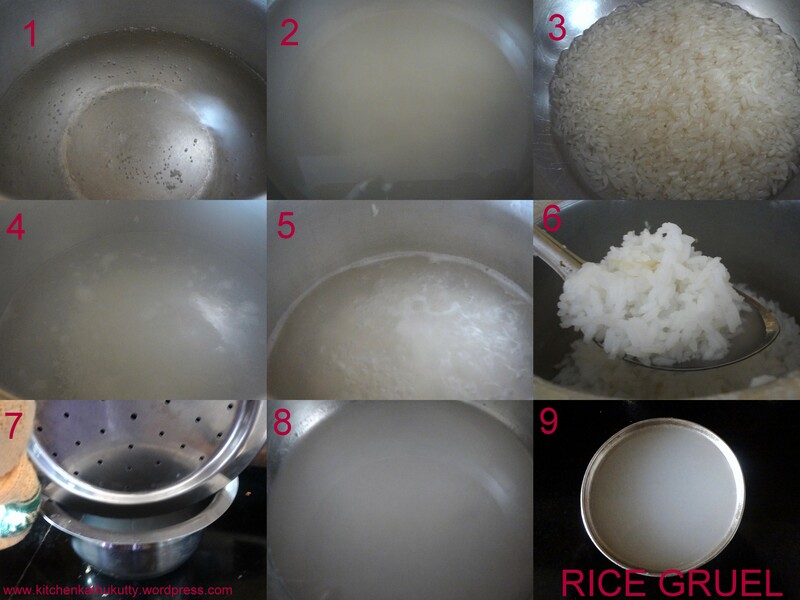 1.Wash and soak rice for 10 minutes. 2.Heat water in a vessel and let it boil. 3.When it boils well add the rice. 4.Keep stirring occasionally to check the cooking. 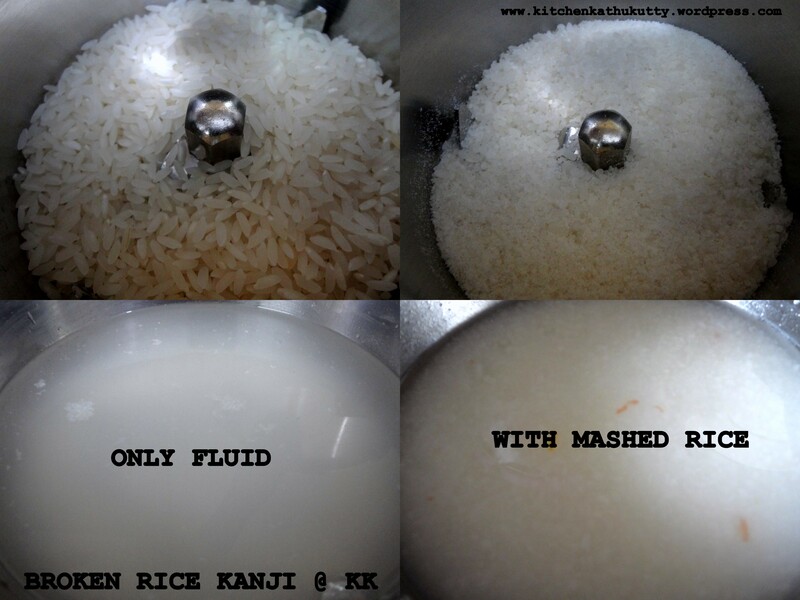 5.When the rice s completely cooked, drain the excess water. 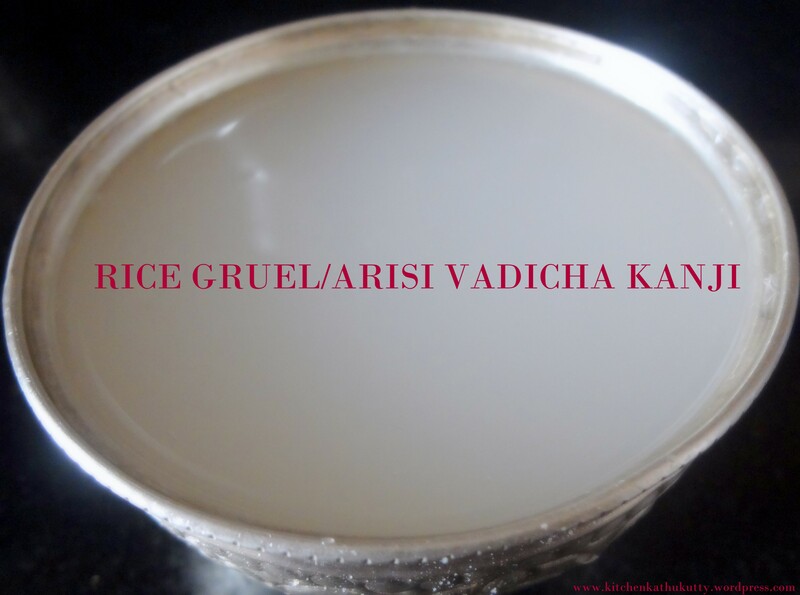 Rice gruel shouldn’t be offered on a regular basis to babies especially in the initial stages of weaning as recent studies reveal they tend to replace the most nutritious breastmilk. The rice should be completely cooked. Add water double the times of what you add usually to pressure cook. 1.Wash and rinse rice well. 2.Dry it in a cloth or sun dry it. 3.In a mixer jar,add the rice and give it a run. 4.Repeat if rice remains whole. 5.Now pressure cook the half broken rice with double water quantity for 5 whistles. 6.Release the pressure and mash the rice well. 7.You can either serve the watery part or mashed rice with liquid depending on age and comfort. You can also break the rice and then wash before cooking instead of drying. Adding salt to this for one year plus is recommended for better results. This shouldn’t be given on a regular basis. 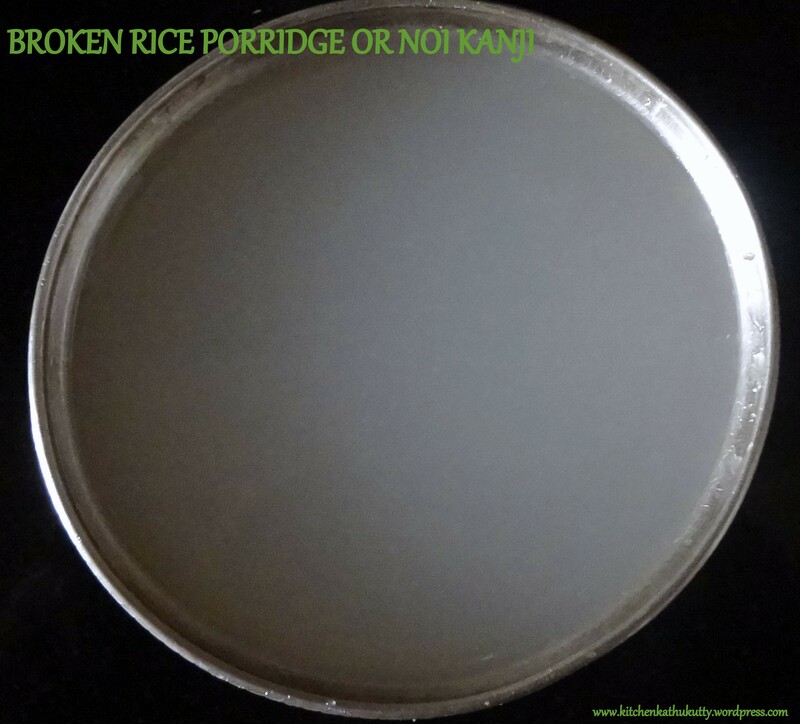 Broken rice porridge and rice gruel might resemble the same. 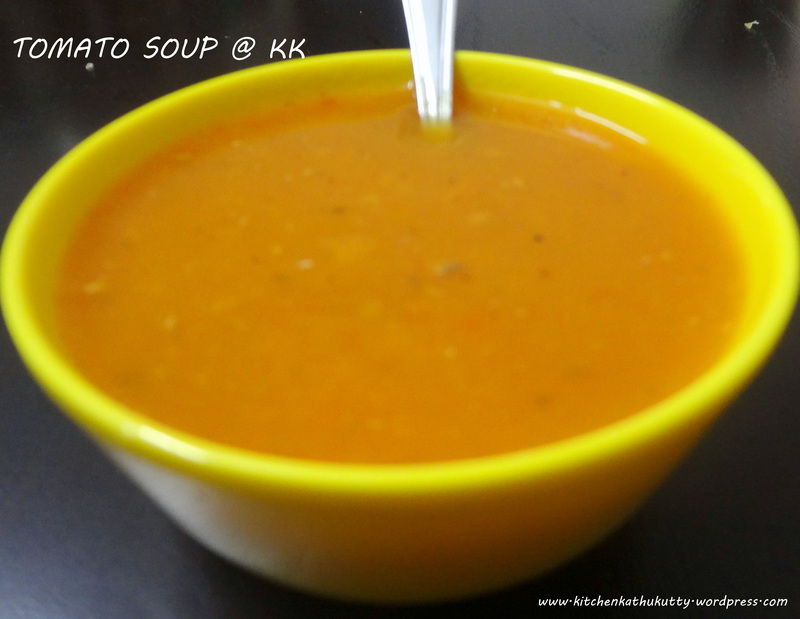 Any warm soup with no oil and much spices may be given when baby has fever/cold/cough. This will help baby feel warm and also remove the congestion. 1.Blanch tomatoes and peel the skin. 3.In a mixer jar,add all ingredients and blend well. 4.To the mashed veggies add half cup of water and let it boil. 5.Add salt and serve it luke warm. Adjust pepper as per your baby’s taste buds. Avoid salt for babies less than one year. The thickness of the soup is your choice.Hence turn off the gas accordingly. Rasam is an essential daily accompaniment for rice in my family. Including rasam in your daily diet and baby’s daily diet post 8 months will help improve digestion and immunity. When climate begins to fluctuate my mother even advises to have half cup of rasam as such on a daily basis for kids and adults. Check recipe of home made idly here. These foods are general recommendations based on my knowledge,experience and elder’s advice. I am not an expert. Kindly have a word with your doctor before introducing any new food to your little one. Each baby is unique and each baby needs unique treatment and recovery methods. Please do not force feed baby. 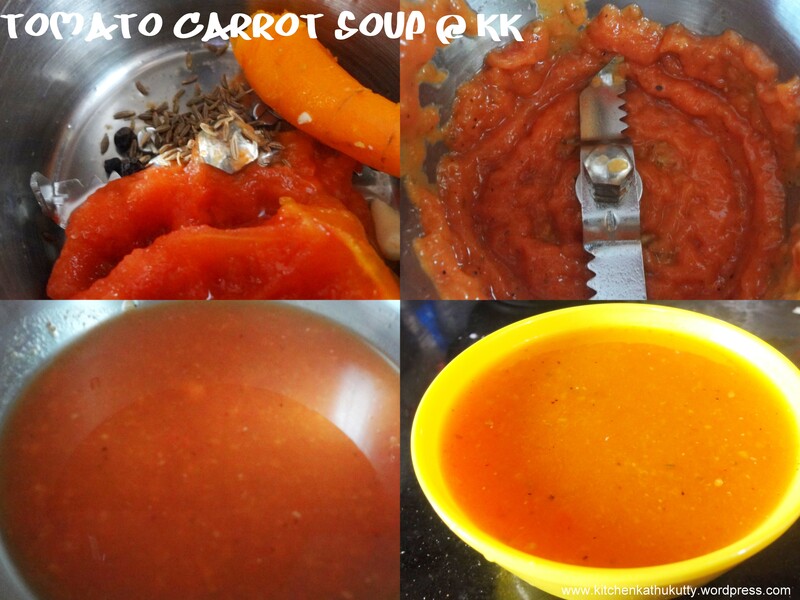 Posted on 03/11/2015 12/11/2015 by Kalyani BalajiPosted in Baby FoodTagged diet during cold, diet during illness for babies, diet during sickness for babies, feeding a sick child, foods for a sick baby, recipes for a sick child, what foods help baby recover baby quick, what foods to offer when baby is sick, what to feed a sick child, when baby is ill what foods to give. My baby 16months, has tummy bug due to her first time in nursery.. I was clueless and remembered your post on FB and came here. I am going to offer her rice ganji and rasam… Very greatful to you for sharing this post. My pleasure 🙂 Thanks for visiting my space and penning down such excellent words.Take care..